For a while I have been trying to create a comment system that would be useful, display avatars, allow YouTube clips to be posted in-comment as well as the ability to reply to comments. Thankfully that came a bit easy with the Google Friend Connect comment gadget. It allows all of that as well as the ability to sign in via Google, AIM, openID and until any spam rolls in, I'll continue to allow anonymous comments too. Sadly, the old google Blogger comment system that was on the site had to be commented out (haha, get it?) and any previous comments are no longer visible. 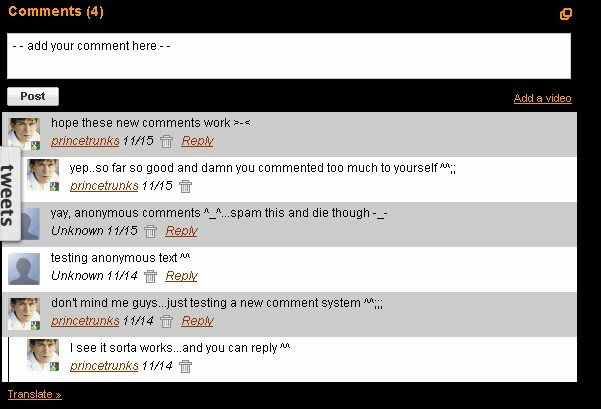 The old comment system was a bit of a bore and thus not many comments were on there in the first place. I also did the same for anime.fm and charlesgaffney.com. The coding for this comment system, like most of the stuff with google is open-source and internet wide so expect more customizations but at least all comments will be kept here for good on the site....of course unless it's spam.